Alice Forrester of Clifford Beers Clinic in New Haven urges preserving social services in the upcoming budget. 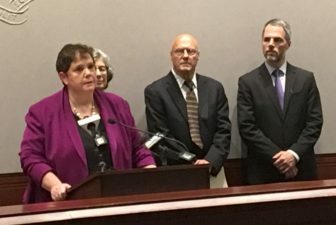 Health care providers joined social services advocates Tuesday to again urge broadening the state sales tax and adding other revenue sources rather than making big cuts in the upcoming budget. Gov. Dannel P. Malloy and the legislature are trying to close a $5.1 billion deficit in the next two-year state budget. Malloy has proposed cutting or eliminating a long list of social services programs that provide aid to people with physical or mental disabilities. Some of those who provide those services said those cuts would have profound effects. “There are many agencies that can get in a month or two, but there are many that don’t have that kind of leverage. They’ll make their payroll and then they’ll have to close,” said Alice Forrester, CEO of Clifford Beers Clinic in New Haven. Derek Thomas, fiscal policy fellow for Connecticut Voices for Children, explained his group’s proposal to “modernize the sales tax” by expanding it to cover more services and allow fewer exemptions. He said the plan would increase revenue by a little more than $1 billion annually. Other options proposed included increasing the personal income tax, reviewing business tax breaks, adding tolls and imposing a tax on sugary drinks. Malloy and legislative leaders are scheduled to meet again Wednesday to resume work on crafting a new two-year budget. The governor has urged avoiding major tax hikes, and neither he nor any of the legislative leaders of either party have so far proposed any sales tax increase as part of a budget solution.